Division of Water’s Watershed Management Branch conducted Project WET training for thirteen Catlettsburg area elementary school teachers. Project WET, Water Resource Education for Teachers, provides education materials and training courses to teachers, students and the general public. Project WET raises awareness about actions that can impact water, and how to improve practices to enhance the overall quality of water. 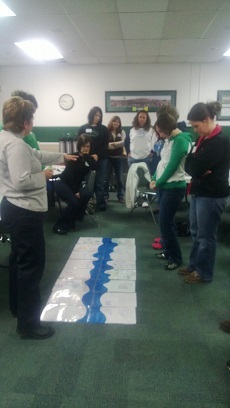 Fourteen non-formal educators in Kentucky were recently certified as Project WET facilitators after completing 16 hours of training through the Kentucky Division of Water. The goal of Project WET, an acronym for Water Education for Teachers, is to provide scientifically accurate and educationally sound water resources education materials, training courses and networking services to citizens, organizations, governments and corporations. Laurina Lyle, Executive Director of Project WET USA in Bozeman, Montana traveled to Frankfort to conduct the facilitator workshop. The Kentucky Division of Water (DOW) has assumed state sponsorship of Project WET, an interdisciplinary water science and education program for formal and non-formal educators of students in kindergarten through grade 12 and adults. The program was previously sponsored by the Kentucky Environmental Education Council (KEEC).